(1) "Misc": Links to useful Web sites, a basic hunting guide, lists of classes, character traits, racial traditions and languages, a breakdown of faction levels, an overview of religion in Norrath, an explanation of heroic opportunities, a list of available mounts (mostly horses), "Game Update" patch notes, the famous "Things I Wish I'd Known Earlier" message from the official EQ2 forums (now completely updated), and finally, a guide to optimizing the game's graphics settings. (2) "Spells": A complete list of spells and combat arts for every class, along with a list of the "fun" spells available to members of each class. (5) "Harvest": Complete lists of the items which can be harvested from various zones, as well as an overview of which artisan classes have a use for the various types of harvested material. (6) "Cookbook": An overview of how food and drink work in Norrath, and complete lists of all provisioner recipes. And for non-provisioners, there's also a handy list of food and drink items with the maximum possible (five-hour) duration. (7) "Alchemy": Extensive information about potions and poisons. (8) "Houses": A list of housing prices, a list of furniture items that can help to significantly reduce the status cost of your home, a list of placeable books, a list of house items you can obtain by completing newbie racial quests, some notes about carnivorous houseplants, notes about consignment containers, and lists of guild status and city faction rewards (many of which are house items). (9) "Socials": A list of all social commands (a.k.a. emotes) in the game, arranged according to which ones are voiced and/or animated. You can have your character perform an emote simply by clicking it on the list. (10) "Notes": Whatever you want to have available for your own reference while you play, that isn't already included somewhere else, can be added here! Obviously, no single person can compile the amount of information included in the Info Center single-handedly. I owe an incredible debt of gratitude to the many people and Web sites from which I've stolen -- er, "borrowed" -- information. As well, of course, many thanks go to all those who are using the Info Center, without whose input it wouldn't be nearly as useful as it has become! Inevitably, there will be errors and omissions in the data presented here. If you notice anything that needs to be corrected or updated, or think of anything that's not here that really ought to be, then by all means, let me know! 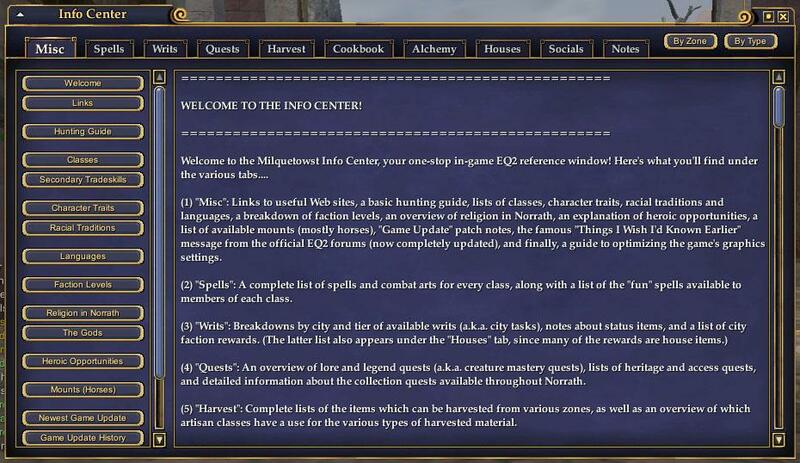 You can post suggestions or comments to the "Milquetowst Info Center" forum thread at eq2interface.com, mail them in-game to either Rainbeau or Fayberry on the Permafrost server, or send them via real e-mail to [email protected] Thanks! And if you happen to have characters with too much money on the Permafrost server, feel free to send a plat or three to one of my characters! Installation is simple: Unzip the eq2ui_journals_infocenter.xml and eq2ui_journals.xml files, and the "infocenter" folder (with its various subfolders), into your custom UI folder. Once you're in the game, you can call up the info center any time you like by typing "/show_window Journals.InfoCenter" (or by creating a macro to do it for you). It is also now possible to access the Info Center from the EQ2 button menu! IMPORTANT NOTE: If you're upgrading from an earlier version of the Info Center, and have already customized some of the "Notes" files, MAKE SURE YOU HAVE BACKUPS OF THOSE MODIFIED FILES BEFORE YOU INSTALL THE NEW VERSION! 070317 - UPDATE - Replaced the Allakhazam "quest by zone" button with a button leading to EQ2i.com's quest list, so both sites' quest walk-thrus are readily accessible. Added a list of signature quests to the "Quests" tab. Restored quest walk-thrus, which are now available through submenus of the "Quests" tab. 070311 - UPDATE - Created Web version of the Info Center (at http://awsd.com/infocenter/). Replaced "Newest Game Update" page with a direct link (through the game's browser window) to the current patch notes. Moved version history to a separate file. 070304 - UPDATE - Updated the L&L book locations list. Removed all quest walk-thrus, moved the heritage quest list and collection quest info to the "Quests" tab, and eliminated the "HQs" and "Collect" tabs. Added buttons to the top of the Info Center window to directly access Allakhazam's quest list by zone or by type, through the game's browser window. 070301 - UPDATE - Updated "Game Update" notes to GU32. Updated various text files with GU32 changes. Updated TIWIKE. Replaced "Credits" page with "Links" page. Added walk-thrus for several signature quests. Updated the "minimize" function so that the window retains its original size when minimized and restored, rather than returning to its default size. Please post any comments, suggestions or questions on the appropriate forum thread, and not here. That way, I'll know as soon as I visit that new comments exist. Thanks! As stated above, your best bet is to visit the forum thread in which this mod is being talked about instead of posting here. is there a simple update to change this to reflect in the game UI? copied everything, and moved it. i made a new txt file, changed to the correct website and renamed it the same file. but now it will not load when i look at it. Think the problem is you created a txt file and lost some of the control codes. I edited the two files involved and will attempt to upload them. Grr hate the instructions for uploading couldnt find the blue button must be blind. Here is the replacement address - http://eq2.wikia.com/wiki/Main_Page . There are actually two files involved. Would suggest you back them both up. The miscellany.xml file is in the infocenter folder. The eq2ui_journals_infocenter.xml file is in your custom ui folder. Make sure u get the punctation marks in correct locations. Last edited by dansherrill : 09-01-2007 at 02:00 PM. I think this mod is great, I particularly like the notes section. How can i add a notes section to other places. Manly i want to add my own quests in the quest section, and possible a link under each quest that will open the browser to a particular URL. Would be great if you could explain how i can add my own custom section to different areas, again mainly the quests section. I want to make a tab for a zone, then list every quest in that zone with a guide and a link to open the browser to an online guide. Make sure that you are not using any illegal characters such as the & symbol. If for instance you are using the & symbol all characters from and including that symbol will not show. IE: "Lore & Legend" will show as "Lore ". I have studied note01.txt in order to get my notes to work. However, I cannot get any editing I do to the notes to work properly. I cut and past my text info and only half the file will show up. I tried splitting the file into note02 and note03 but not all of note03 showed up. Any suggestions? What an awesome mod this is. Goodness, can't conceive playing the game without it. You obviously haven't been paying attention to the recent discussions about the Info Center. Now that there's a working in-game browser, online walk-thrus can be accessed quite easily, without even leaving the game. And the walk-thru collections at Allakhazam's site and at EQ2i are far more complete, and far more up-to-date, than anything I could hope to include in the Info Center. Nonetheless, a few people complained about the removal of the walk-thrus from the Info Center, and so, while I have no real intention of adding to or updating the Info Center's walk-thru collection, I did put the walk-thrus that were already in it, back, in the version that was released a few hours before you posted your question. Where might I find the last version that still had the HQ walkthoughs in it? I first started using this mod when i downloaded Fetish UI, it is definatly my favorite mod for this game, valuable beyond words, Thanks so much for putting it here and keeping it updated! Last edited by darklordkain : 02-09-2007 at 12:17 AM. Keep updating PLEASE more HQ and Signature quests. Awesome Mod, I am ~constantly~ using it in game.. Thank you for such a contribution to our EQ2 gaming.